Laila & Gregory Friddell waited a long time for their wedding day, eight years to be exact. 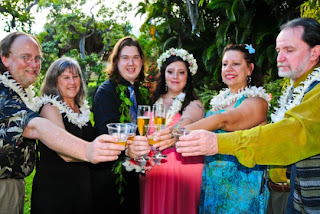 They finally decided to tie the knot on Halloween 2012 in Maui. The couple had waited a long time to make it legal, but they didn't want a big wedding, only both sets of parents were invited to their intimate ceremony at the beautiful Maui Tropical Plantation. 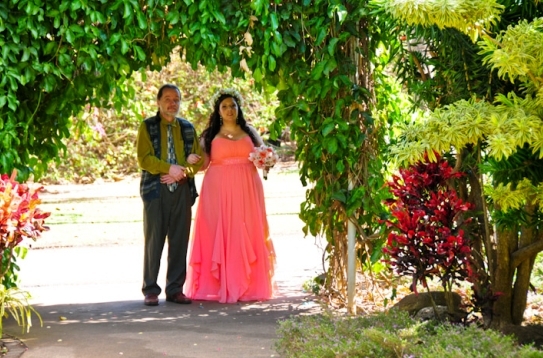 Laila & Greg chose the bustling tropical garden located in the Waikapu valley for it’s central location and lush garden beauty. 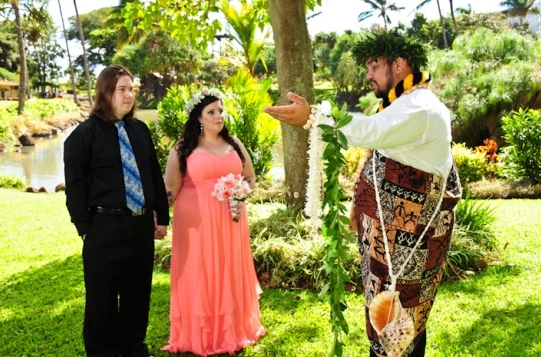 The Maui Tropical Plantation is not only a great place to be married in Maui, but also is a popular visitor location with over 112 acres of planted fields from coffee and bananas to sugar cane and exotic tropical flowers. Their wedding was performed in the quiet garden gazebo area next to a beautiful small lake surrounded by tropical plants, coconut trees and manicured lawns. 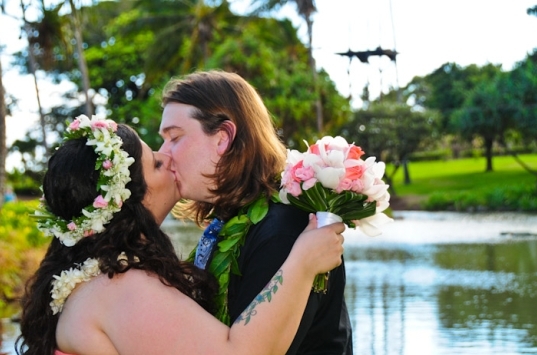 It was truly a fitting location for their Maui wedding. The only other question was... where to stay? After Laila & Greg looked through the 15 Maui wedding packages offered by Hawaiian Island Wedding’s website, the choice was clear, they wanted to be pampered, and chose the luxurious Hyatt Regency Resort in Ka'anapali. 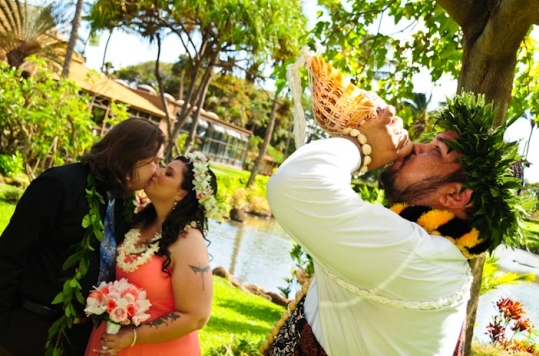 The package that caught their eyes was the Deluxe Ocean Front Ka’anapali Wedding & Honeymoon. Their deluxe oceanfront room offered panoramic vistas of the blue Pacific Ocean and the palm-fringed Ka’anapali Coast. The package had everything they needed for not only their stay, but also their complete wedding. Along with premium ocean front room at this five start resort, they also were supplied with a convertible rental car, daily buffet breakfast, complimentary sparkling wine, lei greeting upon arrival and invitation to the managers honeymoon reception; a private sunset "meet and greet" with the manager and honeymoon couples staying at the hotel, which included complimentary pupus (appetizers) and drinks. The wedding part was just as complete and included the services of Rev. 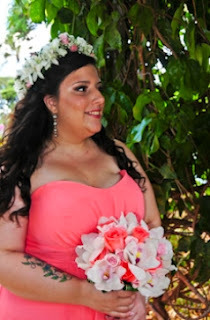 Kamuela Rodgrigues who performed a non religious ceremony, on-site wedding coordination, professional photography, leis to exchange with each other and Laila’s beautiful clutch bouquet with orchids and coral roses that matched her dress perfectly. To top off the ceremony, Laila & Greg asked for the classical music played by Tatyana Shipiro, who is a classically trained concert harpist from St. Petersburg Russia. The ceremony was more than Laila & Greg had imagined and truly a fitting way to start their lives together. Congratulations to Laila & Greg! Wishing you two a lifetime of happiness together! Hope to see you again soon here in Paradise - Maui. For more information about this package, or to book your Maui wedding with Hawaiian Island Weddings, please Contact us.